Alright, so I’ve found a new addiction to add to my many ones which cannot be satisfied in NYC. It’s from Saudi Arabia and I can only find my new lust in the malls of Dubai and Abu Dhabi or on Bond Street in London… Now, before you go thinking that I’m talking about a Sheikh to marry, I’m actually speaking dates. Nope, not the human kind, which come with way too many expectations. 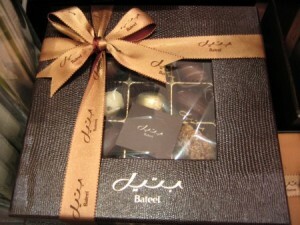 Rather, the fruity, chocolate kind, care of Bateel, a Saudi company, which makes date chocolates to die for! If I’m raising your expectations on this one, trust me, they are worth all that and more. The luxurious tastes of dates and chocolate go perfectly together. Yet, even with the large Middle Eastern population inhabiting the US, Ramadan now upon us, no one makes a decent chocolate-covered date here. Or even sells one! There are one or two date farms in California that offer a seasonal selection of milk chocolate dates, but they’re hardly the gourmet delight of Bateel. If you can think crystallized ginger bits nestled in a gooey date, covered in milk chocolate, or chopped candied orange peel blended with date pieces, all covered in dark single origin chocolate, then you have the right idea. Lets see if we can start a “Date Revolution” and bring the deliciousness of Bateel to our shores. I’m writing to their people right after I post this. I suggest you do the same. Barneys and Bergorf need a little sweetness these days. This entry was posted on Sunday, July 31st, 2011 at 12:05 pm and is filed under Chocolate Corner, Food, The List.